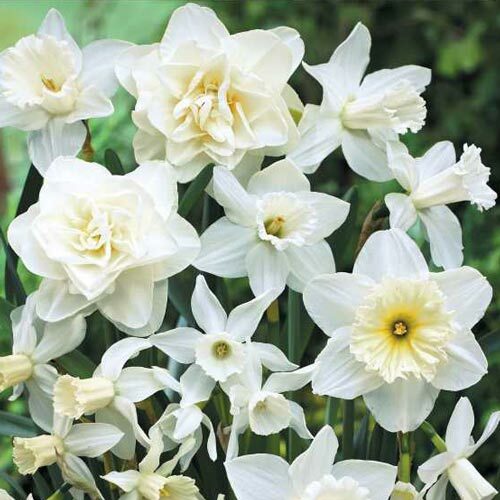 Our unique blend of white daffodil varieties offers a beautiful and luminous display that will continue blooming for weeks on end! Hand-selected mixture includes a wide array of daffodils in various shapes and sizes, each of which blooms at a slightly different, but overlapping time in the season. This ensures a longer blooming season. Mixture includes Narcissus 'Obdam', 'Ice Follies' and 'Thalia.' It's a showy choice for large plantings in borders and woodland settings. Easy to grow and deer resistant, the daffodils also are excellent cut flowers for bouquets. They perennialize well, coming back year after year. Bulb size: 12-14 cm. Daffodils needs at least 1" of rain or equivalent watering each week during their growing and blooming season.